Credit Union of Georgia was founded as a teachers’ credit union and still maintains a strong base of educators in their membership. The demographics show this group as largely female and in their 30s and 40s. Like most financial institutions, this client is always looking for ways to increase wallet share within their membership. So they decided to promote their checking accounts to existing members. JB Communications Group decided to draw upon the loyalty members have to their home state, Georgia, The Peach State. 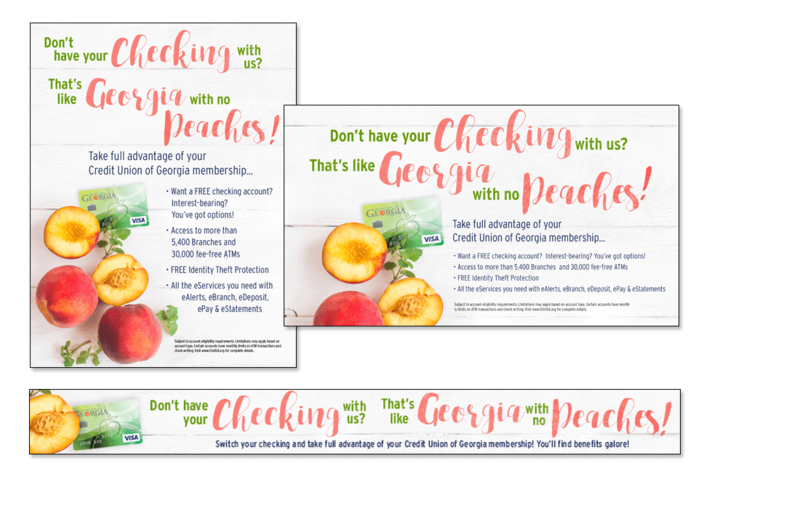 The headline likened being a member without having a checking account to Georgia not having any peaches – unheard of! The design also featured peaches, of course, and also used imagery and fonts which appeal (pun intended!) to the female demographic. This campaign was spread across all possible member access points including, branches, online banking, and statements. This requires a versatile design which works well across many media channels and several sizes and formats.